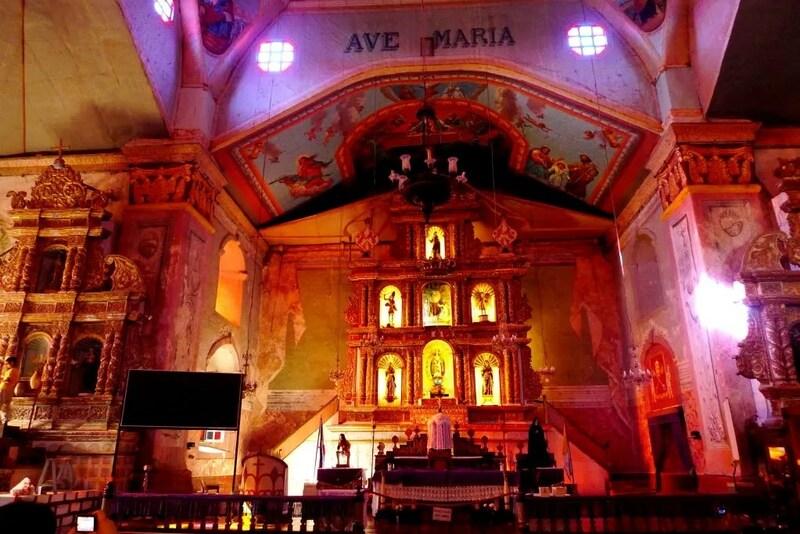 Bohol, already blessed with natural gifts – the Chocolate Hills and the tarsier, is embellished with some of the most visually dramatic Catholic churches in the country. 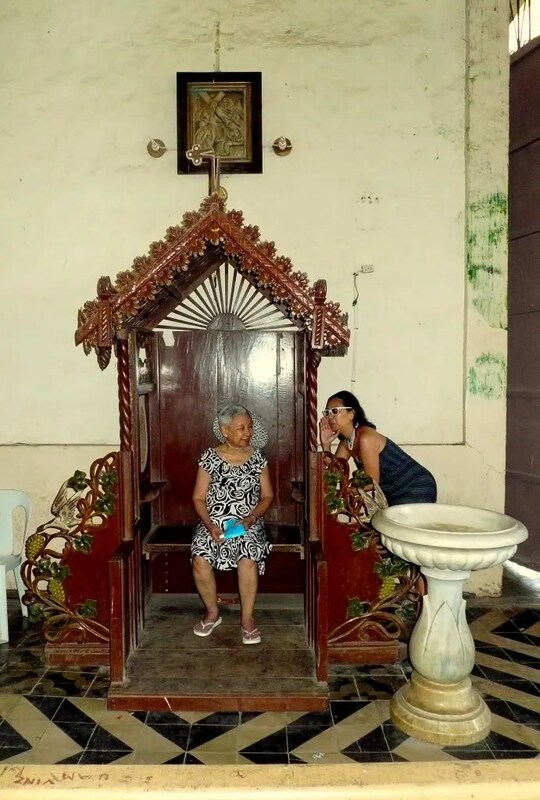 I visited the province with my mother and sister, not on a spiritual journey – none of us is Catholic, but for a more sensuous reason – for our love of heritage and art. The Church of Our Lady of the Assumption seemed out-of-place in this little town. With its tall horseshoe Byzantine arches at the facade, florid murals in the interior and stone towers on its grounds, it was solid evidence of foreign influence on our culture. How strange it must have been – this looming edifice of stone – to Boholanons of centuries past who lived in traditional houses of bamboo and grass. The area around the church used to be fortified against Muslim raiders. The fortifications had since been dismantled by time and circumstance, save for a stone watch tower a few meters from the church, an enduring legacy of colonial power. The Boholanons were conflicted about this power that both conquered and protected them. These days, capitalism had replaced colonialism. The convent that housed Spanish friars was converted into a swanky souvenir shop and alfresco cafe. Earlier that day, I had spotted the church from across Tagbilaran Bay. Its Gothic belfry, crowned by pointy projections, was unmistakable even from that distance. Dauis Church may not be considerably prodigious, but it had been an imposing presence in this little town, unrivaled for centuries. The sun was high when we got to San Agustin Parish. On a Sunday, between masses, we found the church lifeless and empty, its doors and windows flung wide open, letting in the radiant afternoon sunshine. Its interior, a long and hollow vault, exuded a warm pastel glow. It was at a vantage point near the altar that I quickly snapped a photo of Mom, her head and silver hair outlined by a halo of white light from the open front door. 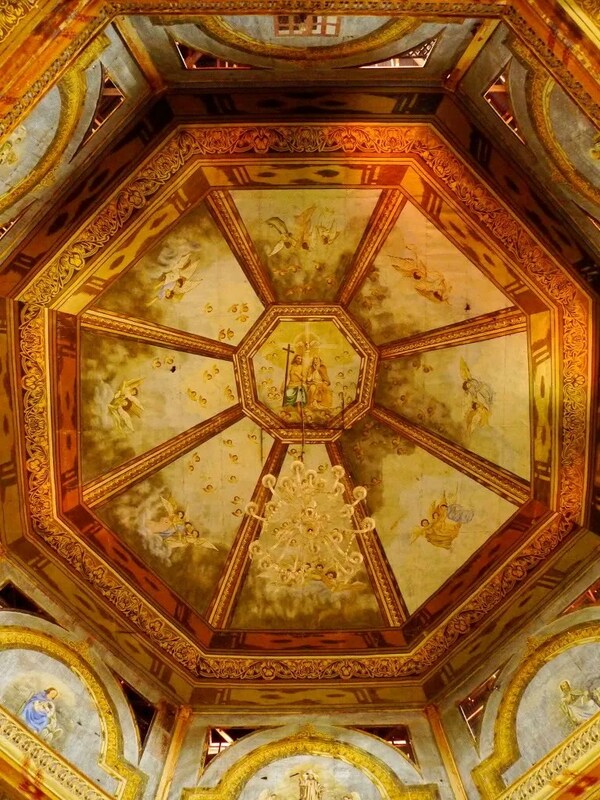 The church’s trompe l’oeil ceiling painting was a glorious celebration of colors, shapes, and heavenly images. I looked up transfixed by its striking depth and vibrant colors in the tradition of exquisite Catholic art. 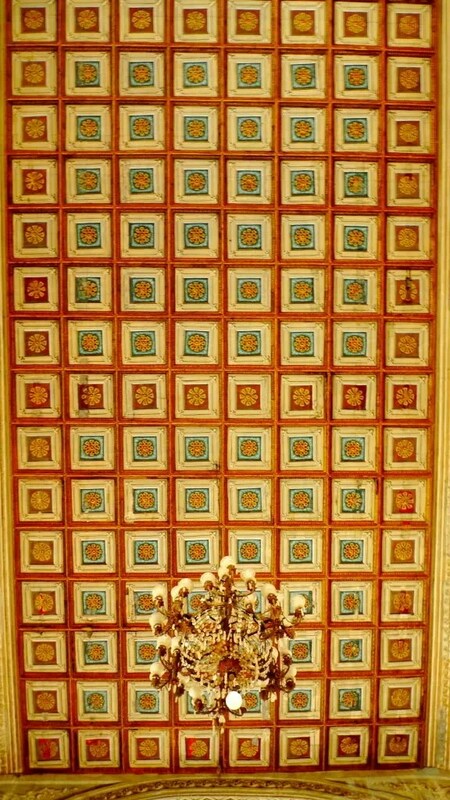 Even the confessionals were symmetrically carved with flowers and birds. Finally a confession in the Garden of Eden, they seemed to convey. We were lucky to have the church to ourselves. On the other hand, I would’ve wanted to see how the parishioners regarded these sublime works of art. Could they have been seduced by these tantalizing visions of heaven above them? 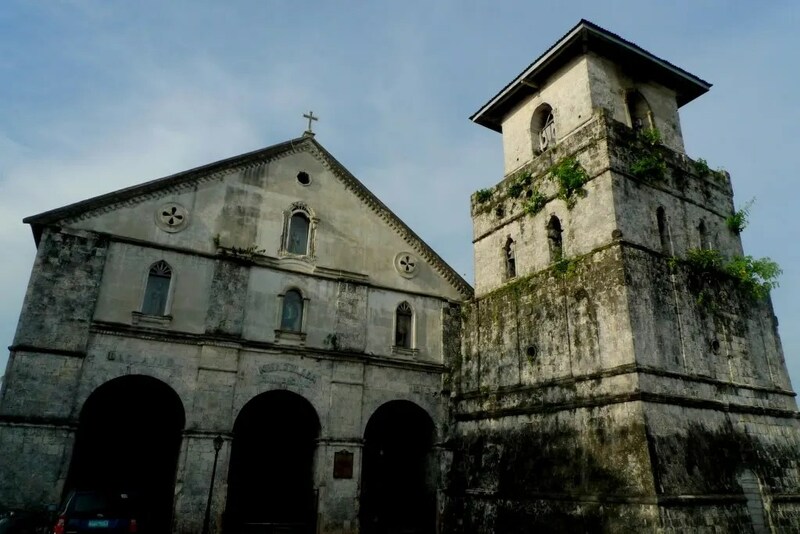 But all church visits in Bohol led to the Church of Our Lady of Immaculate Conception, the original headquarters of Spanish Jesuits in the province and one of the oldest churches in the country. The church, made of cut coral stones cemented together by egg white from what must have been millions of eggs, a fact that Mom was fixated on, was massive. The Jesuits were guilty of forced labor on two counts – for the hens that hatched the eggs and for the men who cut the coral stones from seaside cliffs and constructed the church. 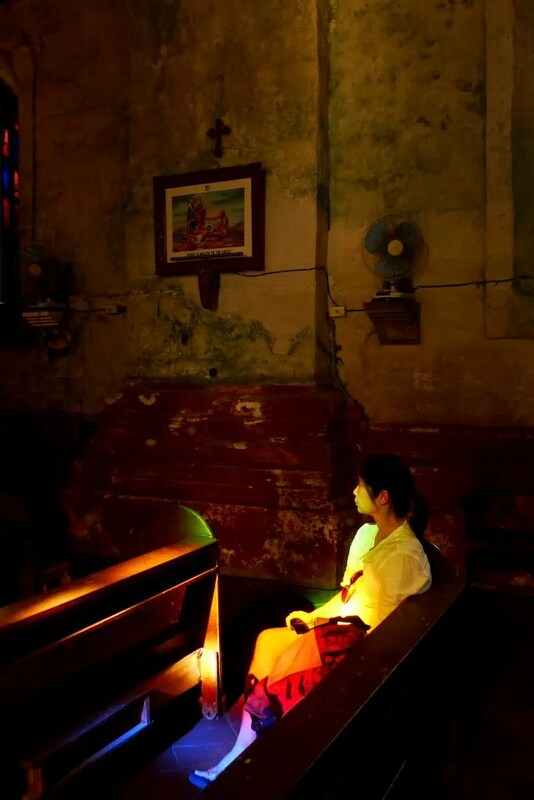 An eerie darkness enveloped the church despite throngs of tourists and local churchgoers. A claustrophobic chamber and the cavernous nave lent an oppressive air. In fact, the church once served as a dungeon for backsliding Boholanons. The church was also a virtual prism; its stained glass windows refracted natural light into rainbow colors. 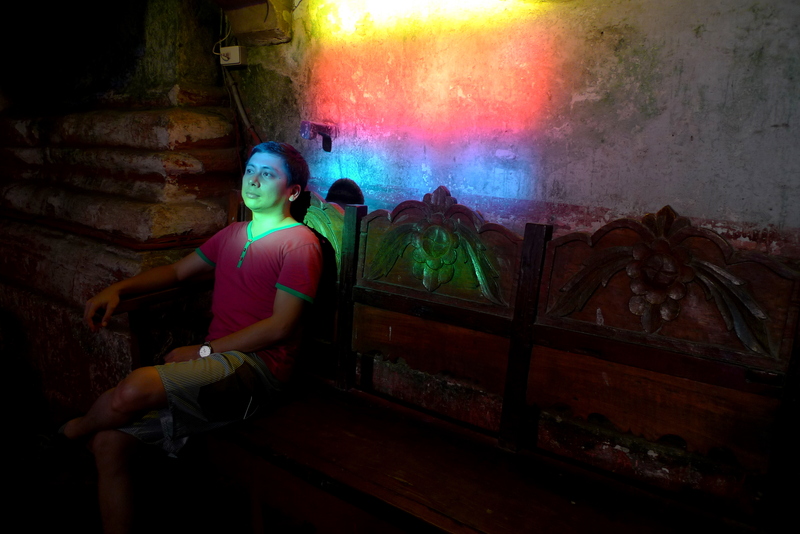 Late afternoons in Baclayon Church cast these technicolor rays on pews and the prayerful. The effect beguiled Mom’s thoughts away from the egg whites in the masonry. In a moment of uncharacteristic initiative, she began conceptualizing art shots around these colorful lights. Changes, surprises, — and God made it all! That may be true of the natural world, but in the Church, they are all man-made. I could imagine the colonial era friars rousing reverence from the people with such artful use of lights and shades. Catholicism may have colonized the Philippines more than Spain did. 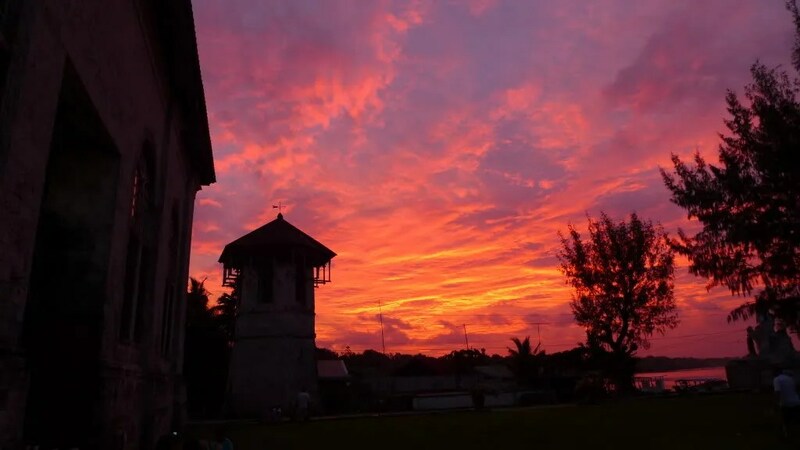 Wow great pictures…makes me wanna visit Bohol asap! Hop on that SuperCat, now na! 😀 Seriously, it’s a sin of omission for someone from Cebu to not see Bohol. Hehe. Confession of a shopaholic yan. 😀 Thanks Gael! Sayang di ako nakapag-workshop for point-&-shooters. I needed that, hehe. Will share this with a friend who is going to Bohol in a few weeks. Thanks Wowers! There are more wonderful churches in Bohol. Tell your friend to check the others out. Love the clever use of light in the last four photos especially Joy in Prayer. I’m running out of words, now. I guess I have exhausted whatever little I had in all your other posts. Let me think. I like Browning and the lines from Fra Lippo Lippi cannot be more true. How did catholicism reach Philippines, Age? The star of David in Belfry of Panglao Church is intriguing. Any Jewish connection? The trivia of egg whites is quite fascinating. Age, how did you feel at the end of the trip having visited so many churches? All enlightened and all? (winks). Catholicism was Spain’s weapon of colonialism. Insanely effective considering that we’ve never learned Spanish but believed the Church – hook, line, and sinker. That’s how the Philippines became the only Christian country in Asia. That star, I think, was a leftover decor from Christmas. It’s the star of Bethlehem in a Christian context, not Jewish. Enlightened? Always. Each time I visit these places of worship, I glimpse the history and culture of that place. That’s always enlightening. Thanks for still finding the words, Mrs. Sus. Made me realize that I must be discussing the same things in this blog. Time for a change, perhaps? Manager!!!!! You already!!!!!! wala akong masabi!!!!! basta !!! ok….. awesome photographs….. specially love the one with your mom…. she is a really good model huh….. marunong mag emote si mommy…. hehehe…… Love the color of the sky dun sa unang photo…. galing din ng composition mo dun sa man in prayer and joy in prayer….. and i also like the framing of the cafe lawis….. awesome! Whoa! That blew me away, idol! Coming from a photographer I truly look up to…. To be honest, I don’t really know composition and framing. I’d have to stop relying on fluke shots and really understand what I’m doing. Great photos, AJ! I especially love the first one. And some history lesson there. Have you been to Siquijor yet? Lots of beautiful old churches there too. Woah! Thanks for this. I failed to enter Dauis when I went there. Sarado. 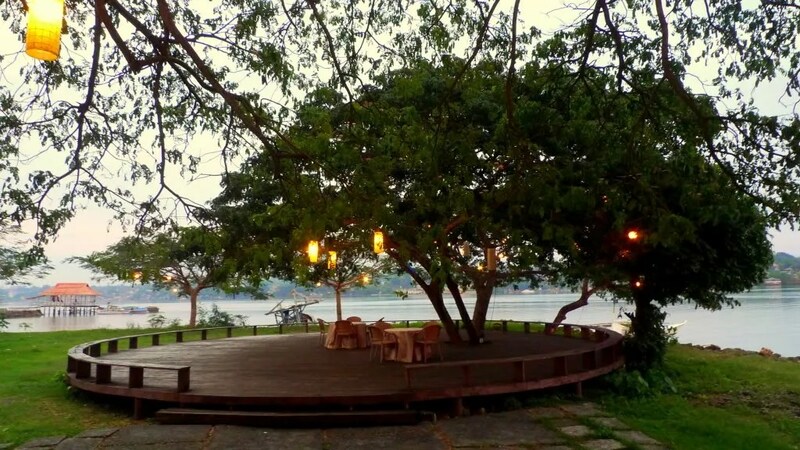 Cafe Lawis is like the one in Prom Night scene of Twilight. Yung magpapakagat sana sa leeg si Bella pero tinanggihan ni Edward. hahah! The rainbow colored stained glass.. ang luvleh! Sarap mag emote no? haha! Wow! Thanks for the props, Jim! i think you balanced text and photos well AJ. Especially good choice to use photos when the subject includes so much in lighting effects. Appreciate your generous words, Jim M. and Deanne! Simply a notation and capture of a wonderful memory. Great pictures and descriptions 🙂 Nostalgic. Winner! Mommy Ritz!!! Minsan lang mag-comment pero it’s a comment to end all comments! Haha! Serioso ba toh?! i am a frequent visitor of you blogs. This one is jaw dropping. Kakatindig balahibo, like journey to the past. Can’t help not to leave a note. It seems like shoots of a professional photographer PLUS your mom’s one and only shoot. hahaha stalker…..hindi mo namamalayan nadikitan pala kita ng sound chip sa hair strand mo nung last eat out natin kaya alam ko lahat happenings about you. kaya, i need not make paramdam coz i’m always with ya! Name palang ng blog, nosebleed na! Love the entry AJ! nagkagoosebumps ako pagbasa ng post especially when you inserted the poem and syempre the way you described the rainbow colors on the tainted window. ganda pa ng photo with the silhouette and ng mom mo (at syempre yung last pic din! haha). suits the mood overall! beautiful entry AJ! Coming from a blogstar like you, it means a lot. And inspired me to do better in my snapshots. 🙂 Daghang salamat Ed. Whoa thanks a ton, Mari! No wonder there’s a spike in my hits. Dunno know to Stumble yet. Gotta get into it! P.S. is it okay if i add you to my blog list… thank’s and Have a nice day! Ok na ok, Gracia. Salamat! Honestly, this is my first time to read your blog and I was blown away. You’re such a good photographer. Idol!!!! Finally Aqui B! Haha! Not even half as good as you. Just a fluke. Sana pala nagsabay na lang tayo. Thanks Tina! Hope to see you next meet-up. Your photography AJ is as great as your writing prowess. I like the way you combined 2 subjects… a human, especially your mother, with the view. I appreciate the encouragement, sir! You always thrill me with the amazing pics on your blog AJ. Cafe Lawis is so serene! I loved the old pics of Cafe Lawis too. Amazing concept I must say! a place where I always wish to revisit. How sweet! Ang close mo naman sa tour guide mo. 🙂 Yeah game talaga si Mom. Di lang cooperative, minsan sha pa may pakana and I’m the cooperative one. Hehe. love your shots.. lalo na yung forgive me mother for i have sinned. Epic!!! hahahaha.. yung joy in prayer, i find it somehow creepy.. feeling ko white lady.. hahaha.. This site used to be called the Backpack Journal. We had the same first name pala. Haha! Lovely. Your such a good photographer. I especially love the ones with the rainbows. Ha ha yes for a while. Not much good with grammar and spelling but thankfully I’m good with people. You teach English too? Takes one to know one. 😉 Yes I do. Started my teaching career in Shanghai, now teaching in a university here in Manila. Cool. I’ll be heading to Asia once I’ve explored Brazil and some other countries around these parts. Perhaps our paths will cross one day. Maybe you could give me some teaching tips! I love church architecture. When I was home this summer I visited a couple of old churches in Halifax that I hadn’t been in for years. Nice photo. Same here, Nancie! Places of worship usually have sublime architecture and artistry. That’s why I love visiting churches, temples, and shrines (haven’t been to a mosque and a synagogue though). And in my country, churches are still used for worship, not only for tourism, so they are still part of present-day culture. Haven’t been to Bohol although it’s ship away from Dumaguete. I love the feel of the old churches and It is so sweet that you spent it with your mom 🙂 Super! Oh, you really should take that boat to Bohol. But I don’t blame you; Dumaguete is too charming a place to leave! Wow! I love your photos – but the first one is magnificent! Maybe that’s because RED works for me!! Thanx for visiting Jim’s ‘Red Alert’ guest post on my blog – it could be you with that 1st photo (or ANY red pix) if you’re interested!! Thanks Red Nomad! So what exactly do I do? Exquisite pictures. The lightings and compositions are perfect. I love Bohol. It’s one of the places in the Philippines that I want to see. Excellent post as usual. You mean Baclayon? No it’s not all gilded, only the retablo. That’s the lighting effect from stained glass windows when they refract the afternoon sunlight. The whole church sparkles in the dark. Magical, really. Ang ganda ng pambungad! The fiery red sunset! I also love the lola photo series, nice idea. I’m eyeing for Bohol na rin talaga. Truly a beautiful place, naturally and historically. They blend well together! Thanks Edmar. I hardly had to do photo editing on the first picture. The sunset was “fiery red” already. I have more “lola photos” in my other posts cuz I usually travel with my Mom. 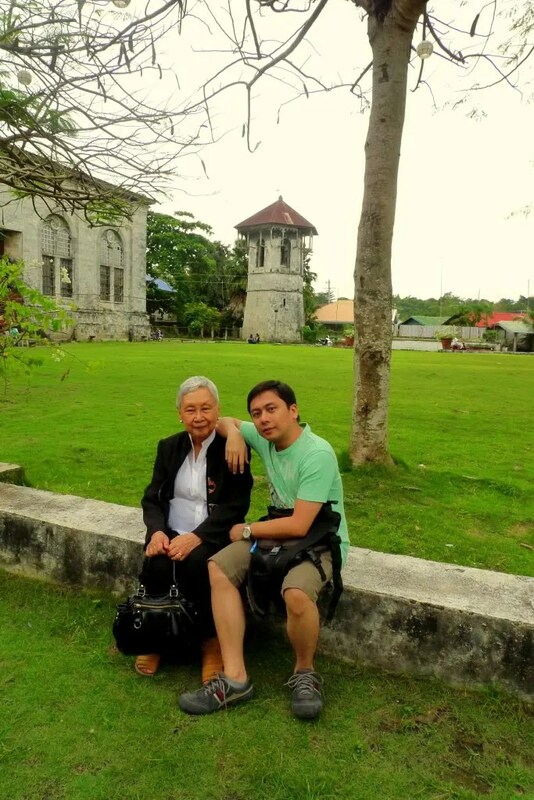 Never had a chance to go visit different churches when I went to Bohol. Baclayon Church was the only one I had the chance of visiting. 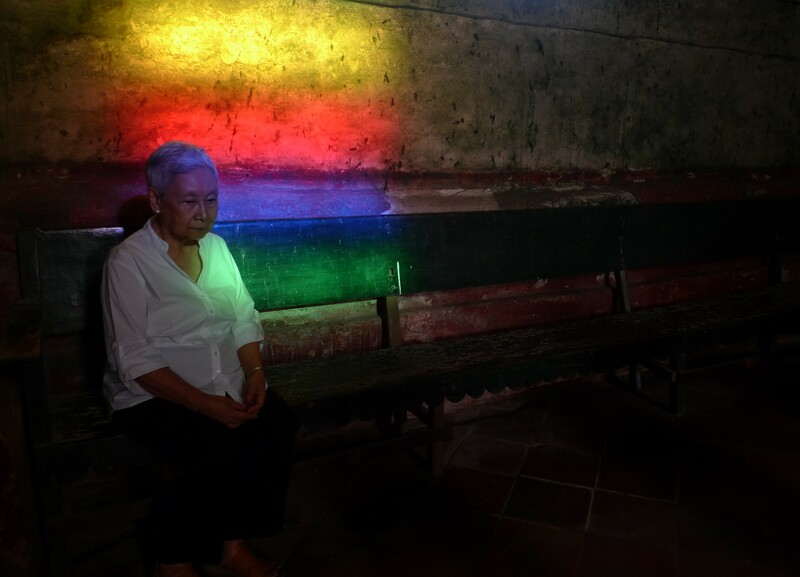 I love the photo ” The Rainbow Ends at Baclayon Church”, tinalo yung picture mo. Haha. Because the model has more appeal in that photo. 😀 I know I’m biased but my Mom is such a beauty. It was such a blessing to have shared my Bohol experience with her. one of my dream place in Pinas! one day I’ll set foot there..promise..
love all the photos! great shots! Btw, I’m surprised (based on most comments here) that many Pinoys have not been to Bohol. A grave sin of omission, really. It’s so much cheaper to travel now so please get that ticket and visit Bohol! next year na si bohol..actually its easy to go therekasi i am from Negros so malapit na sya..iba ang nasa plan namin eh..hehe..Baguio muna then Bohol..hmm..Oo nga no?..parang most of us who comment hindi pa nakapunta dun.. The first thing that comes into our mind when Bohol is heard is the Chocolate Hills and the beautiful pictures taken . 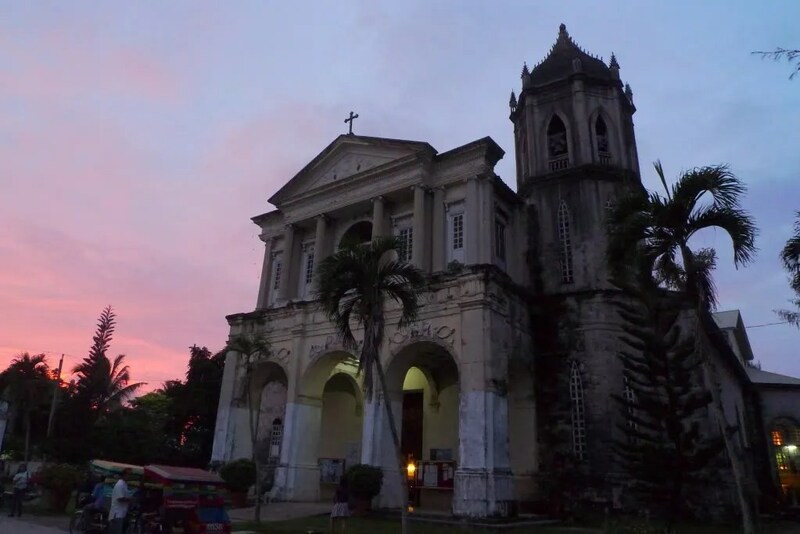 Nothing was said about churches and other places to visit in Bohol .I really like your post showing the other beauty of Bohol and the history behind the churches .YoU captured great photos . True that. Not many people know that some of the best looking churches in the country are in Bohol. They’re not the usual Baroque architecture we see in other provinces. 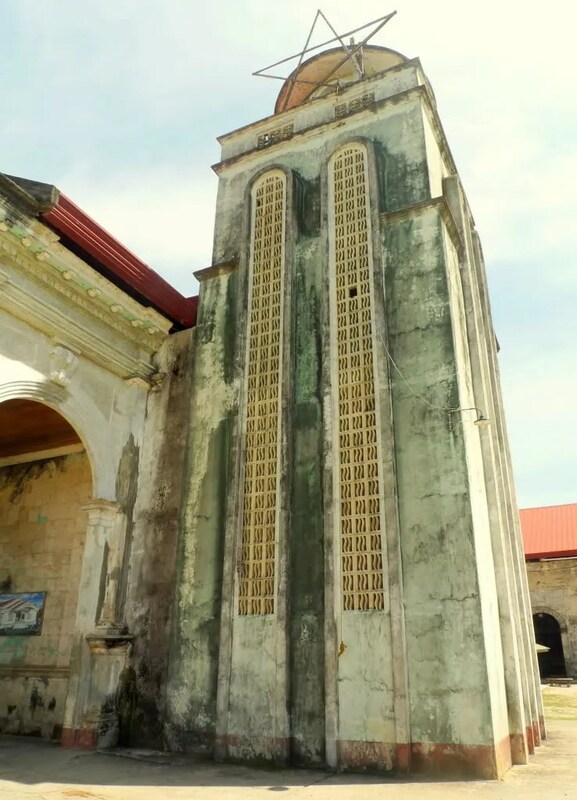 Moorish and Gothic influences set Bohol churches apart. Bohol! It’s one place that I really want to visit. Went there last 2006 and the only church in your post that my officemates and I visited was the Baclayon church. Gee it was really huge and old as well. Will be back there next year 🙂 Can’t wait! By the way, your shots are great! @Yani: Baclayon Church is awesome, but it doens’t have a monopoly on awesomeness. 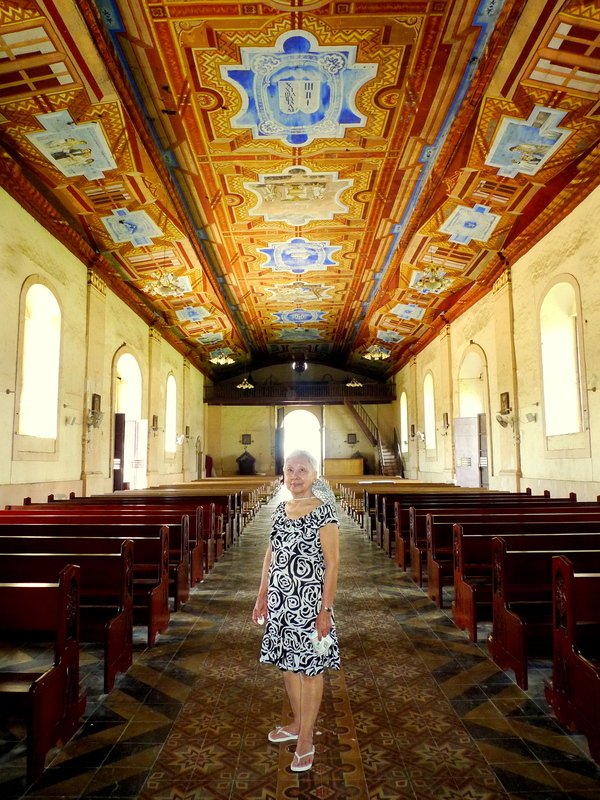 Churches in other Bohol towns are just as awesome, or even more so. great photos you got here.. the lights are just superb. wish i can take pictures like you. @Dimaks: Glad you like the shots, thanks. @Trisha: Oh, I’m a total shutterbug when I travel. But not like most DSLR-wielding people cuz I still wanna experience and really “see” the place rather than composing photos and angling shots all the time, hahaha! All rights reserved. © 2009 - present by Aniano Jose Poliquit. No part of this web site - text, images, videos - may be reproduced, published, manipulated, or copied for public or private use in print and/or on the Internet or World Wide Web, or over any network, without written permission of the author.